What episode(s) do toi like your favori character THE LEAST? With Awakening, I can't even pinpoint my problem. Maybe it's because the last episode (last season) ended with her taking over Bah Sing Se, and then she's accueil just.. wondering around and constantly reminding Zuko about the possibility of Aang surviving. With the Beach..well, it's suppose to be an awkward episode, and it did its job well. I'm glad that we saw her out of her comfort zone- infact, seeing a weakness with her was great. ..I think my problem with that is that it's so.. "teenage-themed." I liked it, but couldn't really get around certain things. 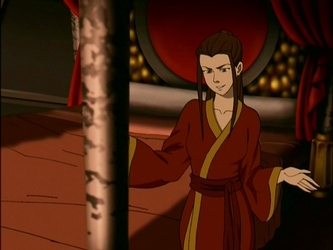 I did l’amour how they confessed certain things infront of the feu though- Azula mentioning her mother was major forshadowing. What's ironic about this episode is, it's one of my least favoris while it's Grey DeLisle's (Azula's voice actress) favori one to voice in. Okay, paragraph over. So what's yours? Well, when toi mention The Beack it reminds me how much of a blowhard Zuko was. He was seriously a weirdo like all of the rest of them. Lol, I know right? He was a bit cringe-worthy too. My favori character is Katara. I was really upset at her in the runaway.She made a stupid decision that endangered the mission. My seconde favori character is Aang.I was really upset at him in "Bato of the Water Tribe" I understood the reason for what he did,but there were better ways to deal with it,and his way was childish and endangered the mission. But over all,I was pleased with the characters,their romance (Katang for ever! ),and the actions they took.I just dislike episodes where very good characters do stupid and akward crap. My favori character is Zuko. Probably the water bending scroll when katara was being a little vag to aang, but it's all cool cause at the end he was really cool with it, almost as if he kind of liked her blowing up on him ;D toi could see that he was a bit infatuated with her in that episode in some scenes. Not that he sometimes isn't. Hehe.